Welcome to the worlds greatest guide to Women's Flare Jeans. Are you actually looking for Women's Flare Jeans? Well, we hope you are because the reality is that you have found our Women's Flare Jeans page. In this women's clothing section of the Apparel Search directory, you will find all sorts of interesting information regarding Women's Flare Jeans. Apparel Search is a leading guide to fashion, style, clothing, glam and all things relevant to apparel. We hope that you find this Women's Flare Jeans page to be helpful. Flared jeans can also be called bell bottoms, is a style of jeans that become wider from the knees down, forming a sort of “bell-like” shape of the pant leg. Bell Bottom/Flare leg jeans can have a light flare up to a very exaggerated flare. At times a moderate flare may be referred to as boot cut. Depending on the manufacturer and how they choose to market that particular pair of jeans. 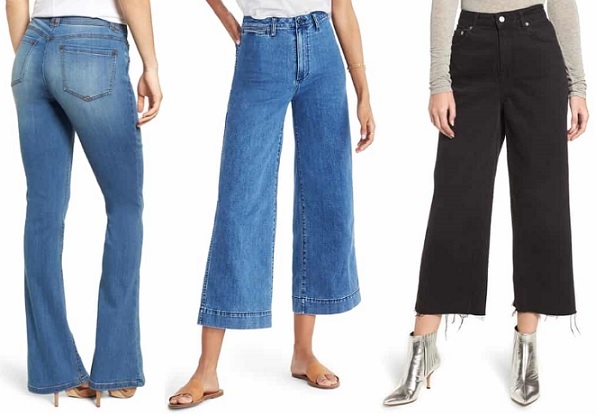 "Wide leg" Jeans are different than Bell Bottoms/Flare because they have a wide circumference the entire length of the legs. What ever style of jean pants you are wearing is stylish. If you want to be even more stylish, you should wear your favorite women's flare jeans. Bell bottom jeans were important during the 1960's. You may also have interest in learning about vintage jeans.